Gamification is different from a Game. The focus in the former is on the journey, but the focus in the latter is the end-result of victory. At the L&D League Annual Conference, 2016, Capt. 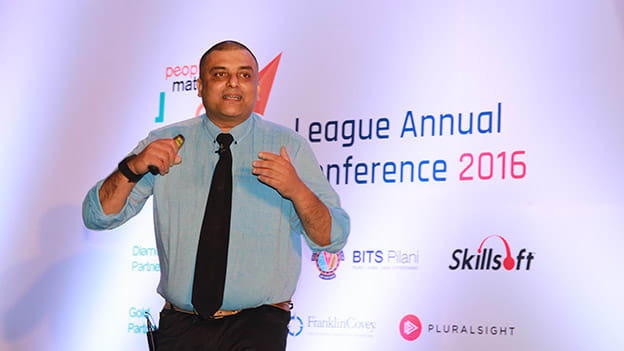 Shantanu Chakravorty (Cognizant Academy) assertively explained, “Gamification is different from a Game. The focus in the former is on the journey and the process, but the focus in the latter is the destination and end-result of victory.” This could well be one of the golden rules of the upcoming trend of enabling learning through gamification. The idea, resources and tools of training have changed dramatically over the years, and although many might write off the gamification as another ‘fad’, experiments and studies conducted at the Cognizant Academy can claim otherwise. The aim at Cognizant Academy was to experiment and explore as many different options as possible, by using, modifying and creating technology, designs and processes to enable a gamified experience. They went in with the understanding that all of them might not work, but were sure they would still provide invaluable lessons. Since observational behaviour is easier to measure, behavioural patterns and parameters were observed kinaesthetic and psychometric layers of interventions, with the former being activity oriented, and the latter being analysis oriented. The results and data collected were not used in a typical ‘debrief’ after the activity was over, but were actually used to collaborate the findings from each other. The games or the activities that the participants were a part of were fun and engaging, but the cognitive and emotional reactions and data was collected and analysed. The use of Near Field Communication (NFC) to seamlessly and effortlessly transfer, share and edit content (data, analysis, reports, surveys, audio, and visuals) made collaboration and exchange near perfect. This concept was admittedly inspired from the retail and wellness sector. In another trial, the temper, pitch and amplitude of voices of people conducting a meeting were recorded to be studied deeply. Even Instant Messaging (IM) was opened up to scrutiny to understand and analyse what goes on in the numerous Whatsapp groups that have become a norm. Furthermore, the application of neurosciences helped study the reaction of an individual and gauge the trigger and level of excitement, aggression or response. Neuromorphic sensors used the data from facial action units to test and analyse feelings, emotions, emotional intelligence and understand the engagement of an individual – the application of which to e-learning interventions could prove to be a game-changer. The several tools and devices used by Cognizant to try the above mentioned methods worked in unison, and often with favourable results. In one experiment, as explained, the participants were told to catch Pokemons, as they appeared, during a three-hour training programme at Cognizant, with a small reward for the person who caught the maximum at the end. As a result, a 100% attendance was achieved for the entire session, which was rare. Capt. Shantanu said that this reaffirmed the notion that ‘People want to play’, and such gamification models will only work when there is a conscious uncoupling of (backyard) problem and the drawing board of designing the process. In yet another game, employees worked to reach new levels, and their progress was displayed publically every week. This movement across the score board made it motivational for players to progress. The use of Klout score, which aggregates the social activity of all platforms, threw up interesting results, wherein participants quickly learnt to swell their social media profiles to get a better score. Another tangent of this was to ensure that everyone started at the same level with a zero score. The study of interplay of Average Distance (connection) between two employees, their Networking Paths (means of communication), and the Frequency of their use established interesting equations and coefficients. The future work space is an interesting and uncharted territory. With technological devices being increasingly cost effective, and organisations waking up to realise that ‘Team Building’ is essential, the question that needs to be answered is how do you study the team different dynamics of two teams who deliver the exact same quantifiable output? The answer lies in analysing the process and feedback in unconventional ways. ‘Nevermind’, a game, tracks real time data and feedback of the player and changes the dynamics of the game according to the reaction. The ‘suspension of disbelief’ will be essential for any gamification experience to be truly effective or fruitful. Challenges will be galore, from stakeholder buy-in, to measuring results. Even at Cognizant, there are struggles to incorporate haptic feedback to measure consistency in performance and using immersive experiences in competency gamification. Capt. Shantanu summed up by saying that we are at a cusp of changing the way we learn, and at least in the arena of gamification, only a few will dare to make a change, most others will just witness it, and the rest will look at it in disbelief and be left scratching their heads.